In the previous issue's SwitchDoc Labs column , I looked at the ESP8266  microcontroller plus WiFi front end and three types of firmware, along with the advantages and disadvantages of each. In particular, I looked at the Adafruit Huzzah ESP8266 WiFi/CPU , which I also use for the project in this issue. In the beginning, I wanted to build two ESP8266 devices to test sun-tracking solar panel efficiencies. Rather quickly, I found I was consumed with learning about the ESP8266, setting up a REST interface, and indulging in a little bit of 3D printing, so I'll have to wait until the next issue to look at sun tracking with the units. Therefore, the unit I am creating here is really just the basis for an IoT device, because all I am doing is focusing on the solar power aspects of the project in this column. Additionally, I will use the Arduino IDE, which is a well-used, proven path to compiling code for small computers using C/C++, with hundreds of libraries for all sorts of purposes. Arduino IDE compatibility has dramatically expanded the possibilities for using the ESP8266 in IoT applications that need web and Internet connectivity. Before continuing, refer to the Adafruit tutorial  for instructions on using the ESP8266 with the Arduino IDE. 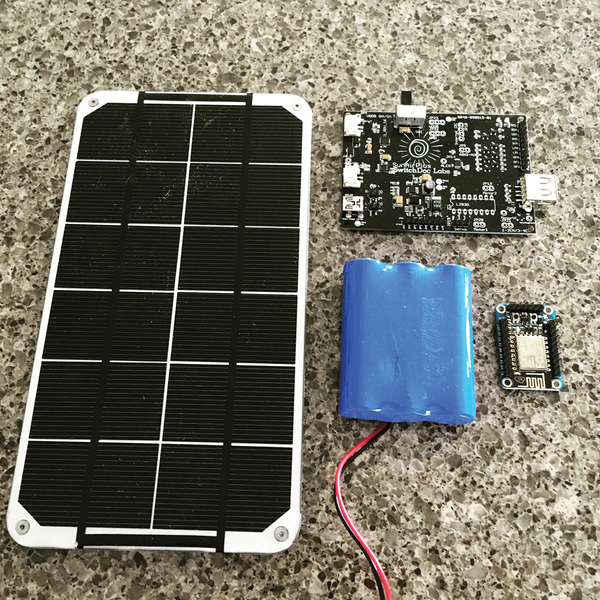 Demonstrate ESP8266 on solar power. Measure EPS8266 power consumption dynamically. Show how to use a REST interface to send data to a database on a Raspberry Pi. Display the data from the Rasp Pi on graphs using MatPlotLib. Add a stepper motor to the solar panel to track the sun and measure the results compared with not tracking (next project). Figure 1: Project parts, clockwise from left: solar panel, SunAirPlus, Huzzah ESP8266, rechargeable LiPo battery pack. Not shown, Raspberry Pi. The system works as follows (Figure 2): SunAirPlus is hooked up to a solar panel and a LiPo battery. SunAirPlus handles all the complexities of properly charging and discharging a LiPo battery. It also supplies 5V to the ESP8266. 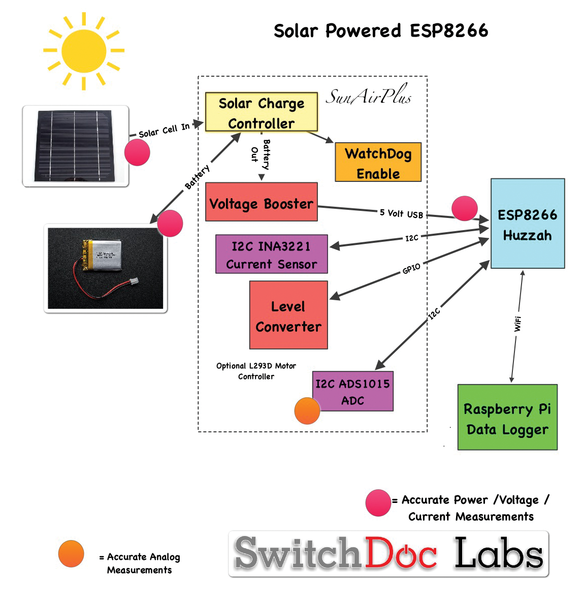 Figure 2: Block diagram of solar-powered ESP8266. SunAirPlus also contains an INA3221 three-channel current and voltage sensor. It reads current and voltage from the battery and the solar panel and the voltage and current going to the load (the ESP8266), allowing you to see exactly what is going on in your solar panel system. The more data the better. The ESP8266 is connected to the 5V power supply from the SunAirPlus (SunAirPlus is smart enough to take power from whatever is hooked to it – from either the battery, the USB power connector, or the solar panel) and to the I2C bus on SunAirPlus. SunAirPlus handles the translation from the 3.3V I2C bus of the ESP8266 to the internal 5V I2C bus of the SunAirPlus. The software on the ESP8266 periodically (every second) stores the values in a circular buffer. If the server doesn't retrieve the data, the buffer just loops around and starts overwriting the oldest data with the most current data. The ESP8266 sets up a web server on port 80 and implements a REST interface. When a web browser addresses the ESP8266, the web server (http://192.168.1.129 on my local network – your number will be different) sends a JSON-formatted string  back to the browser (or a computer like the Raspberry Pi). The ESP8266 software also prints information to the serial interface if you have the FTDI cable  connected. Listing 1 shows the printout as the ESP8266 starts up, connects to the local network, and then begins sampling data from SunAirPlus. When the ESP8266 is queried by a web browser (or a computer), Listing 2 shows what is printed on the serial port.